Holywell Hill sits overlooking the city of Derry, right on the border between Northern Ireland and the Republic. I wasn't expecting much from the other comments but it turned out to be a great little viewpoint, though slightly ruined by the presence of the ugly mast and dilapidated buildings. After an early start I reached the parking spot mentioned by Harry Goodman at 9 o'clock in the morning (376168 F). From there it's a leisurely stroll up the mast access road to the cairn marking the 260m summit which is situated on a little patch of grass behind the fenced-off area. With unseasonably fine weather for November and a clear sky the views extended for miles. 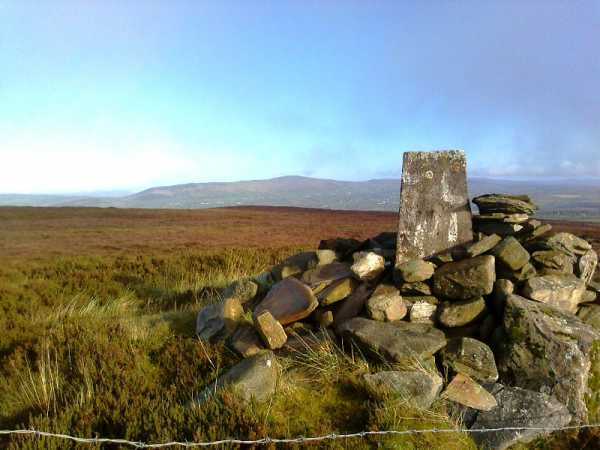 The Sawel-Dart ridge high in the Sperrins was easy to pick out towards the SE whilst the hills of Inishowen lay to the north, Greenan Mountain with its ring-fort and Scalp Mountain in particular are very prominent. I would agree with the other comments that the trig pillar definitely seems to be the highest point. The original surveyors usually got these things right!